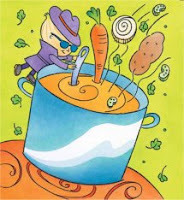 WELCOME TO MY MONEY MISSION ONLINE: SUPER SOUP-ER FRIDAY! Snow day here again today! That means that I have no where to go, no major obligations, and nothing pressing to do. It's like starting the weekend one day early! WOO-HOO! That means that I'll have time to make that Cheeseburger Soup that my teen daughter has been asking for. Have you ever had it? Oh.My.Goodness!! It is sooooo goood. 1. Brown the hamburger and onion in your soup pot. Drain. 2. Add rest of vegetables, parsley, basil and broth. 3. Cook until potatoes are tender. 4. Meanwhile, in a large skillet, melt the butter. 5. Add flour; cook & stir until bubbly. 6. Stir in milk & heat until thickened. Add to soup. 8. Add cheese, salt & pepper. Cook & stir until cheese melts. 9. If using shredded cheese, add only a small amt. at a time, stirring well to ensure that it melts completely after each addition. 10. Stir in sour cream. If you want to turn this cheeseburger soup recipe into a bacon cheeseburger soup recipe, then cook up some crispy bacon and sprinkle it into the soup just before serving. Super YUMMY! ARE ALL OF YOU HAVING FUN?? WHAT ARE YOU DOING?? IF YOU CHILDREN HOME BECAUSE OF A SNOW DAY, HOW ARE YOU KEEPING THEM ENTERTAINED?! Have a great day with your kids! Oohhh...bread bowls; that sounds delish!! I have never made those but I have ate them. YUM! It's DJ's first snow day of the year! Anna had school but she didn't go because of her teeth. DJ is vacuuming so he is not as happy about his day off. But I keep reminding him that a little cleaning is better than shoveling! Den and I did that. Hi A. Marie! Thank you for visiting my blog! I hope you will visit again! I'm going to put your link on my blog...I LOVE new recipes, and this one sounds like a winner! Stay warm! That sounds wonderful.I never had it. I have had hot dog soup. Have you? I'll have to post it on my Vintage Thursday post. I'll sneak it in with the desserts. all the snow out there I think of you guy. That sounds delicious! Can you believe it is even cold here in south Florida? All of the wild iguanas are hibernating and dropping from their trees!